All the computer users try their level best to keep the system free from all kinds of malware infections. An infected PC not only affects the system performance, but can also lead you to great troubles, such as loss of data or corrupted files. It is always good to know about the rivals before making a final decision. 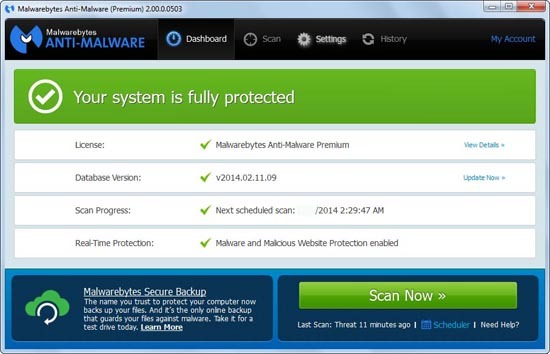 The Malwarebytes Antimalware Premium received a very good remark from both the customers and the experts. McAfee could get only a mixed review from the customers and an above average score from the experts. Malwarebytes was able to secure high scores in all the lab tests performed by experts to test the efficiency of the software. The superior performance of the Malwarebytes was to shield the PCs from any hostile activity, as it is able to block the malicious websites. When compared to McAfee, Malwarebytes was able to win more points as it offered more unique and efficient features to safeguard your system. The different scan modes, automated scheduling, Website protection module, and Access policy management are only a few to mention features that make Malwarebytes a more preferred choice. The easy to operate and intuitive GIU makes Malwarebytes more user friendly and functional. In addition to the anti-rootkit component and Chameleon feature, the compatibility with third party software and minimum impact on system performance are the highlighted ones in the appealing feature list of Malwarebytes. The Hyper Scan feature allows the users to perform a quick scan of your entire process. The lightweight installer allows you to install the Malwarebytes Antimalware premium without rebooting the system. Dashboard: summarizes all the key system details, including your real-time protection level, database version, and last scan time. Options and Settings: It has all the options that allow you to manage the software. You can set the scheduler to run automated scans and updates so that it can work well even when it left unattended. Scan: This option gives access to the different types of scanning. Advanced Settings: It allows the advanced users to customize the behavior of the protection. Malwarebytes is one of the top rated cleanup-only antivirus realms that can offer effective real time protection against almost all latest malware attacks. The personal user�s can use the Malwarebytes antimalware free, but for commercial purposes, you need to pay for the Malwarebytes Anti-Malware Premium 2.0. This edition gives you all the functionality of an effective antivirus tool. The free version does not include the scheduler. The attractive and brand-new user interface makes it easy for the users to operate. It works behind the screen, without using much of your system resources, whilst extending the search beyond the signatures of known viruses. The powerful tools can remove the most hard to shift malware program from the infested system and clean-up the PC in no time. The three flexible scanning modes and the scheduler makes the scanning process simple than ever before. The lightning fast Hyper Scan mode allows you to scan and detect malicious programs and websites in no time. The database updater helps you to keep updated with the latest threats, thereby saving your system from all kinds of hacking and phishing threats. You can use Hyper Scan to have a quick scan of all your processes. You can use threat scan to scan your entire registry. The custom scan allows you to select the files that need to be scanned. The Malwarebytes Antimalware Premium uses their signature, heuristics, and behavioral technologies to automatically detect and save you from the threats that were undetected by your security suite. Malicious rootkits are hard to be removed, but the Anti-Rootkit technology of Malwarebytes makes it possible for you to get rid of the worst malicious rootkits. You can also use the malwarebytes removal techniques to remove malicious programs, when your antivirus fails to do so. The use of Malwarebytes Chameleon technology ensures your protection in all levels. It helps you surf safely, without the fear of anyone stealing your credit or personal information. The antivirus compatibility and less impact on system performance make Malewarebytes Antimalware Premium the perfect choice to enhance the security of your system. The Malwarebytes Antimalware Premium cannot replace any antivirus security suite, as it does not provide protection unless a malware disaster strikes. When complemented with an effective real time antivirus the Malwarebytes Antimalware Premium offers you real-time protection from all malicious programs and guarantees peace of mind. It protects your system and credit information from all most all sneakier security threats.